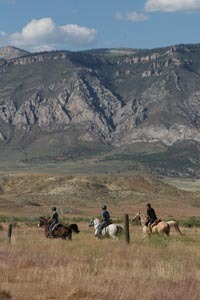 Rising abruptly from the high desert valley, the Big Horn mountains loom large over basecamp for the 41st annual Big Horn 100/50/30 mile endurance ride. Carved by uplifts and glaciers, the mountains were born 70 million years ago. 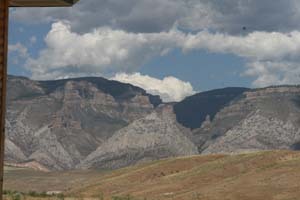 The range was named by American Indians for the big herds of bighorn sheep at its mouth. The Big Horns have been inhabited by humans for 10,000 years, evidenced by rock shelters, petroglyphs and pictographs. 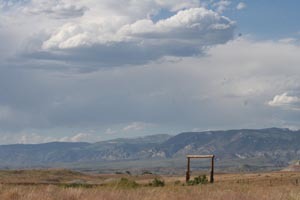 The rock Bighorn Medicine Wheel, on Medicine Mountain, is 700 years old and is the most important of several medicine wheels in the West. Even earlier, dinosaurs hung out here. 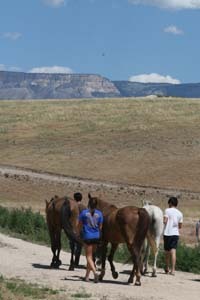 They all left their footprints then; we were coming to leave our human and horse hoofprints on the trails now. The intrepid endurance junkies came from all over to ride the Big Horn: California, Colorado (Kevin and Rusty), Wyoming (Kevin), New York, Iowa, Colombia (the country). Steph and I came from Idaho to crew for Kevin, Kevin and Rusty. Roxi Welling, from Iowa, brought 3 Colombian Young Riders with her - they will be riding in the FEI North American Junior/Young Rider Championships in Kentucky on July 29. The two boys and girl had never done a 100 before. What an adventure this was going to be for them! Two more juniors were here to tackle the big one: 16-year-old Joe Haeberle was back with Scooter - they finished the Big Horn last year. 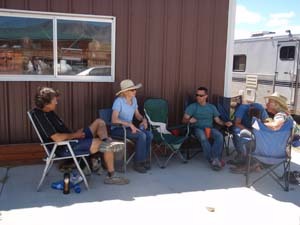 It's a HOT day in Ridecamp outside of Shell, Wyoming at the base of the Big Horns. Mid-90's with an oven breeze blowing. We shelter in available shade as we sit around telling tall tales. Tall tales of the Big Horn are an essential part of the history of this ride. Kevin, Kevin and Rusty vet in their horses... (um... no vet cards are available... the Ride Manager is not around - apparently she is out marking trail, so the vets just scribble on pieces of paper. No numbers are available for horses, so they are just made up, and the vets paint numbers on the horses' butts), and then they go for a warmup ride, over the start of tomorrow's trail. 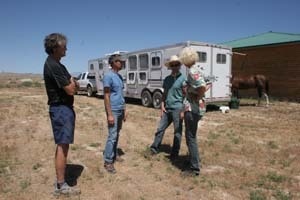 The vets look the rest of the horses over. It looks like around 25 will start the 100 at 4 AM tomorrow. The pre-ride meeting is held in town at a community hall. A tasty home-made dinner is served and we wait for the Ride Manager to begin the meeting. She never shows up - she must still be marking trail. The head vet starts the meeting... but all he can really tell everybody is the pulse criteria is 68 all day at all vet checks. (68! Here in the Northwest, anyway, we are used to a 60 pulse criteria.) He also says there is still snow melting up high, and there's some sloppy ground - which conflicts with what we'd heard before coming here, that the trails were clear of snow. He also warns everybody that there is no phone service, no radios, no quick way out, no way to communicate anywhere in the ride, if anything happens. "Be very responsible for your own horse." The 50's will ride a one-way trail, from base camp to the ski area (finish for them, and vet check 2 for the 100's) - and this will be the same trail that the 100s will be following in. This seems to be the perfect solution to making sure the trail is marked for the 100's, because in past years, it has not been marked for various reason, (markers have been pulled by sabotage, storms come up, or it has just not been marked prior to the ride), and people have gotten lost up there in the dark, and have spent the night on the mountain. Quite understandably, some people are a bit worried about unmarked trail, since it's happened many times before; others have come prepared for that, with GPS points from last year's ride. The exact mileages between vet checks is not really known (this will affect some riders later); the exact route is not yet known (this will affect the entire 50 mile ride later) - as I understood it, the Ride Manager (?) had marked this trail, had removed "a little" of the original trail and "added a little" more at another place, and nobody knew which direction, clockwise or counter-clockwise, they would be riding this portion. The vet said he'd let riders know before the 4 AM start, or at least at Vet Check 2, before riders took that trail. Almost as an afterthought, Cindy Collins, who has finished the Big Horn a number of times, and who would ride the 50 this year, prefaced her statement with "I am not Ride Management, but..." and remembered to tell everyone that the trail for the 50's was marked on the LEFT hand side (in most rides, trail markings are on the right, and an upcoming turn is marked by 3 ribbons before the turn, and one or two ribbons after the turn, to confirm you are on the correct trail). This should be easy for the 100's to follow, since the ribbons would be on their right; however, when you are looking for ribbons on your left as the 50's would be doing, hung behind the bushes from your direction, they are sometimes harder to see. I did wonder why, if ride management or a person appointed by ride management was riding, walking, or ATV'ing that trail, and was hanging ribbons on one side of the trail, why it was not possible to also reach over and hang ribbons on other side of the trail for when riders were coming the other direction. There were no official crew driving maps or directions given out - you just had to know who to ask where to go, or hope you could hook up with someone in the morning who you could follow. There were no official detailed rider maps given out. This pseudo-ride meeting might have been appalling to some, or unnerving to the uninitiated, but, well... that seems to be the pattern of the Big Horn. There were rolled eyes and chuckles when it was said the Ride Manager was not present for the meeting (and hadn't been seen in camp at all), that the details - directions, mileage - of the one new loop on the trail were not available, that there were no crew directions, nor detailed rider maps given out. Hopefully most people who came to ride had either done the ride before (there were many who had), were riding with someone who had, or they knew to come prepared to just wing it if necessary. It's not a ride for sissies (said Tom Noll once, who rode the Big Horn 5 times and finished 4, and was overtime the year he got lost in the mountains for lack of marked trail), nor for the faint of heart (Kevin Waters said after this year's ride). 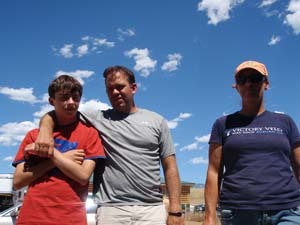 We returned to basecamp after the pseudo-meeting, and helped Kevin, Kevin and Rusty finish packing Kevin's truck with the gear for the up-to-24 hours we'd be out: human food and clothing, chargers for the 3 GPS's the boys would be taking with them and recharging in the truck at every vet check; lots of Ibuprofen; horse food and blankets and extra tack; chairs, cell phones (which wouldn't work anywhere all weekend), books, cameras. Steph and I set our alarms for 3:30 AM (the boys were probably getting up around 2:30 AM for the 4 AM start); we didn't get to bed till 11 PM, and as we didn't get much sleep the night before we were probably going to be real perky tomorrow. Hopefully my crewing job would be an improvement over last year's dismal job at Tevis. Hopefully we would have great weather all day and night. Hopefully our boys would finish (they estimated 2 or 2:30 AM, if nothing untoward happened.) Hopefully everybody would finish and not get lost this year. Hopefully everyone would have fun! 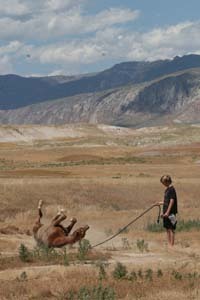 This was going to be another Big Horn adventure for sure!